The Lasallian Education Council (LEC) held its annual summer meeting July 17-19, 2017, at the Christian Brothers Conference office in Washington, D.C. The LEC welcomed two new members: Sulema Modesto, dean of studies at Cathedral High School in Los Angeles, California, and John Vitek, president of Saint Mary’s Press in Winona, Minnesota. Dr. Kurt Schackmuth, vice president for Mission and Academic Services at Lewis University in Romeoville, Illinois, officially began his term as LEC chair. He succeeded Charlie Legendre, AFSC, director of the Office of Evangelization and Catechesis in the District of San Francisco New Orleans, who served as chair for three years. Dr. Scott Kier, superintendent of Lasallian education for the Midwest District, started his term as secretary. 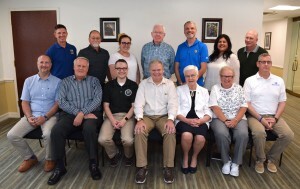 Established in 2011, the LEC shares responsibility for the Lasallian mission among the Brothers and Partners in the Lasallian Region of North America, and on behalf of all who participate in the mission. It is responsible for the oversight of mission formation/education programs and the expansion of mission-related activities and ministries.